Wedding music Siena - Wedding at the Lazy Olive, Asciano, Siena. Home » LIVE! VIDEO LIST » Wedding music Siena – Wedding at The Lazy Olive, Asciano, Siena. Wedding music Siena – Wedding at The Lazy Olive, Asciano, Siena. 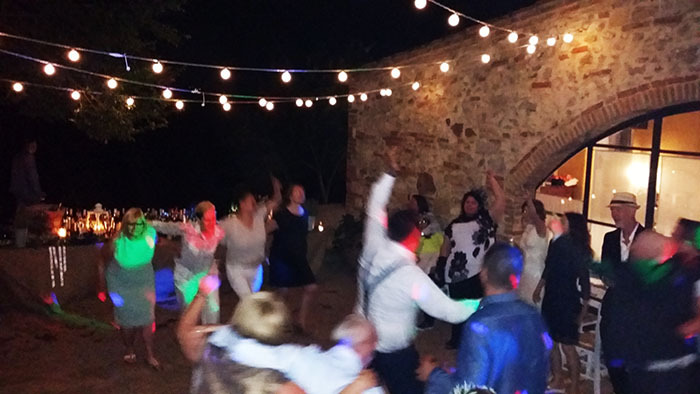 Wedding music Siena – Small wedding party at The Lazy Olive, Asciano, Siena. An English wedding party at The Lazy Olive, Podere Finerri – localita Finerri, 53041 Asciano (SI), Italy, the newlyweds Kelly and Jon both from UK. Guty and Simone “the Italian wedding musicians” can play “live music + Dj set” everywhere, from the biggest wedding venues to the smallest and intimates places (just check the list “Where they have played“). In any case everybody will enjoy their performance and will dance the whole evening. Somebody said that “The Lazy Olive is “The 8th wonder of the world” because of its breathtaking 360° view of the tuscan hills. The Infinity pool is lovely and there’s a great area for guests to spend the day playing games & relaxing. You can eat some wonderful dishes using local produce all served in such a relaxed atmosphere. The ceremony takes place in the big lawn near the pool, the aperitifs by the pool and the dinner in the back of the house. Guty & Simone provide a sound system in the dinner area for a Spotify playlist made by the bride then set up their main sound system in the courtyard for the after dinner party, great LIVE music and DJ set to make all guest dance all the evening!!! – Get an amazing video of your wedding with the “Italian wedding videographers” team! – Get your SIAE permit online here!